I have never had Marag before. It is a hyderabadi soup / curry especially served during weddings as a soup or with sheermal and rumali roti. It is of Arabic origin and adapted to Indian taste by adding additional flavors. My husband has been mentioning Marag on several occasions and now that I am on a cooking spree I thought I should give it a go. It was delicious and so filling. It was also very rich and heavy. I will keep this for special occasions or when requested by my husband again. It is worth making as it tastes really very good. I do not eat a lot of spice. I cut down the spice level than called for in the recipe but I will be posting the recipe as is. You can decide on the spice level accordingly. It is prepared in 2 stages. 1. Clean and wash the mutton pieces. Remove all the water and add it to a pressure cooker with all the ingredients under step 1. I first pressure cooked for 5 minutes (whistles for 5 minutes) with 2.5 cups of water. Then again pressure cooked for 5 minutes (whistles for 5 minutes) with 1.5 cups of water. 2. In a non-stick cooking vessel, heat oil (you can use oil in which you fried onions) and ghee. 4. Add the ginger garlic paste and the green chilli paste. Stir well and fry till the ginger garlic paste starts to turn brown. 5. Add the onion paste, cashew paste and the roasted coconut. 6. Fry till oil starts separating. At any stage if you suspect burning or sticking to the bottom then add water by tablespoons at a time. 7. Add coriander leaves and yogurt and start frying / stirring on low flame for about 30 minutes. The marag will be tastier as much as it is fried this way. Keep adding water little by little whenever there is any sticking or burning. 8. After about 15-20 minutes of frying, add the coriander powder, cumin powder and the garam masala powder and keep stirring. 9. After 5 minutes, add the pepper powder and salt. 10. Finally add the cooked meat along with all the soup which you had cooked using step 1 ingredients. 11. Adjust the water consistency according to requirement and boil for about 5 minutes. 12. Marag is ready. 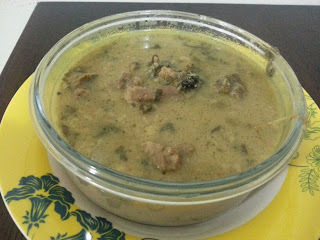 Serve as a soup or with any type of bread like rumali roti, naan etc. That's nice. I am so proud of my sister Anjum whose recipe you have adopted..